Well yesterday “Show” day finally came. I woke at 6 am to start getting ready for a 9am athlete brief. I wanted to make sure that I had a good breakfast and most of my make-up was done before I left since I know the venue is small and prep space is scarce. (she’s from Montana) and we have been commiserating via Twitter for the last 5 months. So it was great to put a face with name, and she is so stinkin’ cute. Then there was @LanelleP (she’s from Miami/Bahamas) another face with a name…we shared a dressing area and just had a great time. I am totally looking forward to doing a show with her on the East Coast sometime this year. There were several other Twitter girls who I got to meet and know so that little family just gets better all the time. Not to mention all the cheering support from @BikiniorBust, @Fit_Michelle, @babytatten, @lilfitprincess, @survifam (she showed up to watch and cheer us on! get to feel the love), and so many others I am totally forgetting. Thank you! I did not make 1st call out for Masters or Open which was disappointing but I got up there and completed the first leg of the journey. Lance Armstrong did not win every leg of the Tour De France but still took the title more than any other rider. So with this thought and my favorite quote “Pain is temporary. Quitting lasts forever.” Onward and upward I go! 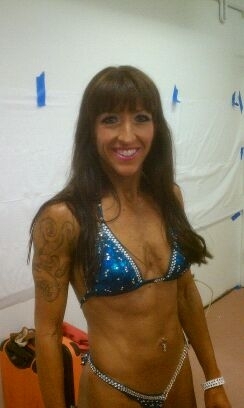 Back Stage all dolled up! scream and cheer from the audience. I could not see or hear anything else except him and all I could do was smile. When I finished to hear him say how AWESOME I was…and truly believe it means I won no matter the outcome. That moment is something no one will ever be able to take away! I love you Calvin! I also have to thank my trainer, Chris…but he deserves a whole blog posting to himself…come next week. After the morning show, we took off for Yummy Bakery in Santa Monica and cupcakes were our mission! We picked up 4 huge cupcakes…2 buttered popcorn and 2 yummy fudgie, it took all my willpower not to eat them on the way back to the night show. Once we got back to the venue I just took some me time, putts with my phone, got to know some of the other girls…just relaxed. I figured the night show was suppose to be fun and that’s what I was going to have. Now the waiting…because we go on last so that means it will be 10:30 before Figure even starts. that is allot of time to waste. Same drill as this morning, we get to do all our poses, then comparisons and top 5 are called. Well I knew in advance that I was here so no worries, next time! I did learn allot about stage presence and also maybe it was more an issue of posing than size…we will see when I get comments back from the judges. This will help with the next phase of training. If it is posing/presentation I need work on, well then another show is in order sooner…if it is size, I will take some time and build and do another show in the fall. So it looks like I have a game plan. 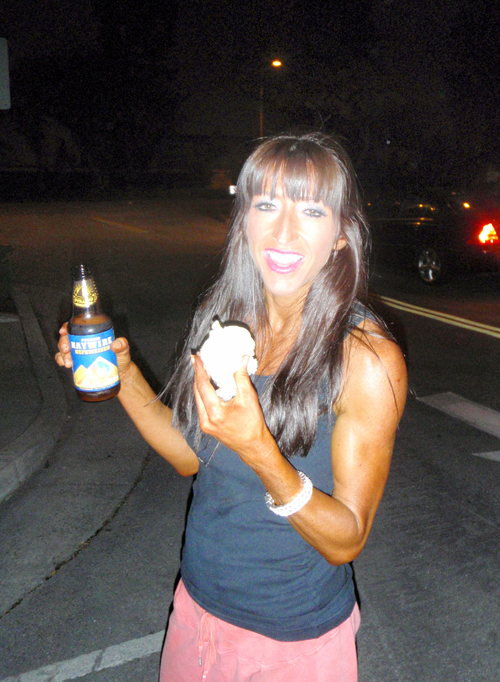 After the show ended it was right to the car for a post celebration tailgate style of beer and cupcakes! Yes I said Beer and cupcakes together and it was delightful! I could not think of a better way to end the day! What a great way to put faces and computer personalities together! I enjoyed being there for you and Staci! I think you did an amazing job and think you have a bright future in this sport! Congrats again Liz!! You did amazing!!! Congrats Liz!!!! You looked PHENOMENAL!!! You worked so hard and I am impressed by your ability to manage the crazy obstacles and random circumstances that could have knocked you down (and any one else would have given up!!! or postponed to another show!) but you stuck with it!!! CONGRATS ON YOUR FIRST SHOW!!!!!!!! You looked so great Liz, so proud of you! Way to go, you are definitely an inspiration to me! !